If you are looking for the easiest species of fish to catch in December, well its not trout and its not reds and certainly not flounder. The species I am talking about is bass. These little green things are everywhere and it doesn’t get any easier than right now. They taste great and catching numbers of 50 to 100 of them is very possible. The limit is 10 per person in the Pontchartrain basin but most people play catch and release. It you like to play catch and hot grease these little rascals taste great in the frying pan as I like them as much as speckled trout. Well if you are the type that only likes chasing trout trout well have fun getting up at the crack of dawn in the cold and fighting the crowds. Ill be sleeping in late and fishing where you don’t see a boat all day catching bass on Matrix Shad till I’m blue in the face. Where you may wonder? Pretty mush all the marshes off the West Pearl or the Chef all the way to the Chalmette Wall. In the winter they are going to pile up in the deeper ditches that connect shallow duck ponds. Most people think of bass fishing as a slow grind where you have to cover a lot of water and make a lot of cast. 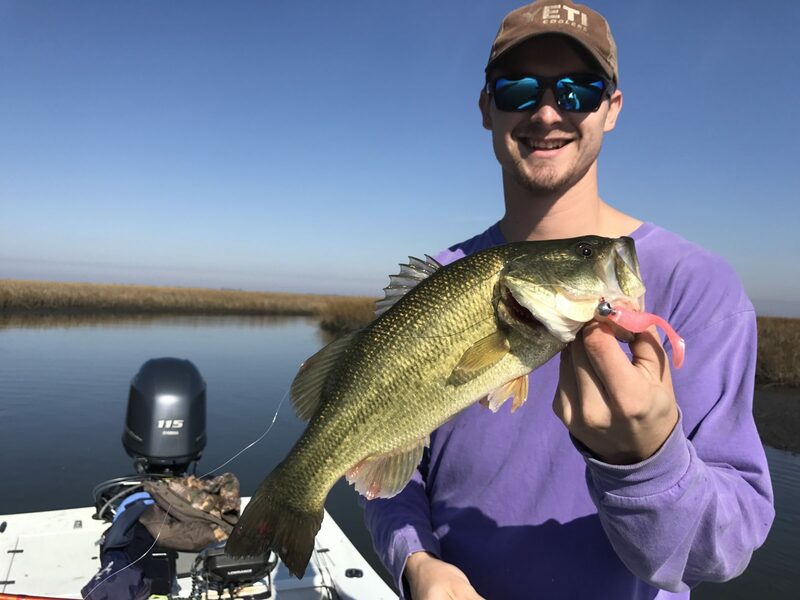 This is not the case with marsh bass in the winter in south Louisiana. A lot of times marsh bass fishing is what they call a one stop shop. With the closing of the MRGO and the trout fishing on the decline, I suggest you sharpen up your bass skills and get in on this insane action in the month of December. Watch all of our latest DockSIde TV episodes chasing these bass deep in the marshes to see just how fast and easy the action has been.